Is the flu boogie man in your closet? 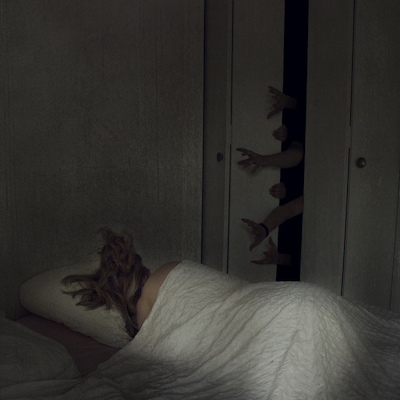 Image by: John Lee Maverick - Theres nothing under your bed. It is that time of the year again where you are reminded of your risk of the flu boogie man hiding in your closet waiting to get you. If you don't get this flu shot, you might die or worse, kill someone else because you spread it to someone else and they died from it. When I hear someone trying to fear me into doing something or demanding I do it, or else; I step back and really analyze what is happening. If something is so good for me, I should be allowed to decide if I want it. When fear is involved, I'm more likely to not take the proposal. I'm not afraid of the flu. I'm not afraid of someone else with the flu. I don't want to get it but getting the flu shot does not guarantee that I will not get the flu. There are plenty of people that get the shot and end up with the flu. Please, don't email me the normal medical jargon because I've heard it all before and I don't need it. Thinking about the flu shot, I don't know that I have ever received one. I had a friend/coworker once plead and beg for me to get a flu shot and he was going to pay for it. It was like my life was about to end and he was going to save me. I found it to be weird because it is just the flu that I may or may not get. My wife doesn't receive it either and we do fine without it. We know if we get sick, exactly what to do. Rest, hydrate, and support our body naturally. Imagine this.... It works every time. in a position to even utilize the flu shot with a weak immune system if it does what they say it does. This shot with some of the ingredients could make their immune system worse! Are there people that die from the flu? I don't know of anyone that has but I'm sure somewhere, people do. People die from all kinds of things. The CDC says they estimate how many people die from the flu because, THEY DON'T KNOW how many actually do. You can read about it for yourself. Getting the flu shot can be (I believe it always is) more harmful then beneficial. The ingredients in the shots can cause health issues which may not show till later in life. The thing is, when bad health conditions appear, you can't point back to where it came from. This creates more business for the medical establishment and the drug companies who created the shot for you in the first place. All I'm suggesting is to do things naturally and think for yourself. Learn as much as you can and don't instantly believe what you are being told, even the studies and research you come across. Some of it is just made up but comes across as honest and complete medical studies. My focus this year and going forward is to do as much as I can naturally, without synthetics to improve my health and life. (Note: some supplements have synthetics in them even when they are said to be 100% natural or organic. Synthetic vitamins are made by drug companies. Their drugs get into your supplements). I'm not telling you to get the shot or don't get it. It is up to you do decide how you want your body treated and what is put inside. My hope is that you will join me in improving you and your family's health naturally. You can do it and I can help. Link to Image There's nothing under your bed.